The Sway's victory brought out the Oracle for all of us warmongers to see, and now that she is assigning yet more battles to take place, her motives are... well, suspect at best. But to understand her motives, we must understand the Oracle herself. Who is she? Where has she been all this time? And why is she so intent on making us Neopians battle? We'll figure it out—together. The Oracle declined an interview—something about how we "should've seen it coming" that she'd say no—but we've been able to get some scraps of information from those lucky enough to hear her, ah, "wisdom." 2. The boons she gave to The Sway were, well, interesting. Her boons included manipulation of shop owners, faeries, the stock market, and the trading post—and each of them were packaged under some pretty shady names. "Bank Bribery" doesn't sound like the most up-and-up boon for an Oracle to be dishing out. Just sayin'. 3. She's been living under—er, in a rock for years now. Just let that sink in. So what is this Oracle all about? There are some theories floating around, and each of them seems logical. We'll leave it to her to tell us which of them are true and which are not, but as of right now, this is really all we have: speculation! Theory #1: The Oracle is a scorned Petpet. Hey, remember that time you took your Petpet to that secret laboratory ray and it just... disappeared, without a single trace? It's not an April Fool's joke, Neopia: the Oracle could've been one of those vanished Petpets. We imagine it could've gone like this—that rascally Kookith thought up his machine, and the Oracle was one of its first testers. When she disappeared, the Kookith realized he had a real hit on his fur, but had to make some adjustments and all that. Think about it—doesn't the Oracle look like an overgrown Ghostkerchief, just a little bit? Perhaps her spirit is a vengeful one, forcing Neopians to battle if they like their little Lab zaps so much. Theory #2: One of the Wraiths from The Faeries' Ruin decided to go "good." Remember those Wraiths? They're even Petpets now! Well, despite the fact that good old Hanso and Brynn saved the day, maybe some of that residual Wraith energy managed to find its way to Tyrannia. They're not too far away from Brightvale, after all. And once that Wraith got to Tyrannia, maybe it pickled itself into a boulder and made some plans... plans to deceive Neopia by posing as a benevolent Oracle—and bring Xandra back from the Stone Age... and back into the Stone Age! Theory #3: A mysterious staff member is having a little fun. If you go to Krawk Island, you can read up on a little competition called the Krawk Cup. Back when Deckball was a newly released game, there was a little competition among some people called Staffers (whoever they are!) to see who was the best. It's an interesting little story to read about, especially when you notice that one of those aforementioned Staffers is none other than "The Oracle." All there is to know about this Oracle is that they have no face—just a mysterious question mark. Could this Oracle be a Staffer in disguise? Theory #4: The E-Z line has a new spokes... oracle. The E-Z See Crystal Ball, a prize from something called a Lost Desert plot (weird, huh? ), introduced a whole new line of merchandise to Neopia. Seeing as the Oracle's mainstay is that she tells the future, she could be just the latest pitch from the E-Z company. And think about it—chemistry, lockpicking, battleaxes... all of them are E-Z brand products, and each of them are related to the factions who came to the Obelisk. Coincidence? Or not? Theory #5: Igneot got bored. In his cavern in Moltara, Igneot will be happy to tell you your fortune... in a mysterious and not-always-applicable manner. You can ask any question you like. But it must be so aggravating to sit in Moltara and get endless questions about Magma Pool times or the secret to the Edna avatar (which, by the way, we'd all love to know, hint hint). Perhaps Igneot got bored and cooked up a little steam to send over Tyrannia's way. Moltara's underground enough to pull it off, and steam does rise; the question is, though—who's controlling this wispy Oracle, then? Igneot himself, or did it gain sentience? Theory #6: Jerdana did it! Jerdana is a powerful sorceress who hails from Altador. She hoodwinked Neopia—albeit for the greater good—into believing Altador didn't exist for 1,000 years. And in case you haven't noticed, a certain annual competition is coming up: the Altador Cup. The home team is one of the only teams to never do even remotely well in the competition. Could Jerdana have boiled up a little cantrip to keep us busy battling, too bruised to cheer our teams on in the Cup? Time will tell. Theory #7: It's all just a bit of Faerie Dust. Theory #8: This is a good Spirit! No, really! 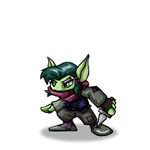 Neopia has seen its fair share of malevolent spirits. Qasala had to reckon with the Spirit of the Ruins. Neovia suffered from the tricks and temptations of the Spirit of Slumber. And, if the reports are to be believed, a certain ghostly trickster is still haunting the Deserted Fairground: Hubrid Nox. Usually, spirits aren't so great to Neopia—but this one seems to be nice... except for the whole "let's battle and cause pain to each other" business. Perhaps this is the nice-looking sister of some of the more malevolent spirits... and maybe she's hiding an even more rotten core. Theory #9: She's just who she says she is. Hey, the Battledome can be fun. With enough healing potions around, a kerscuffle or two is enjoyable. And at the very least, her presence—or the rumors of it—brought to light (eh heh) some of the more secretive Neopian factions. She's forced them to play their hands, when they were once silent. Perhaps her true gift was that knowledge, and now that she's asked some factions to continue stepping forward to enjoy her boons, maybe she wants them to stay in the light, where we can see their actions more properly. Theory #10: She's a big liar and wants to wreck Neopia. Predictably, we have absolutely no idea what the Oracle's intentions are, or what she's going to do. The best thing we can do is to sit and wait—maybe toss a few throwing stars in the Battledome, just for kicks—and see what happens. At the very least, let's be prepared—the last time Neopia trusted a source of (reputed) wisdom, one of our worlds fell from the sky.